If you are wondering that how this book can be your winning guide and advantageous. Here is a bit of insight which will uncover that what you can expect to be inside this book. The book will let you know that how one should handle his key factor, the employees and extract the best from them. You may have productive brains and brainstorming ideas but how will you succeed if you do not have the required workforce to execute the work properly. Understand the principles of entrepreneurship. Processes that are involved in this whole entrepreneurship journey. From tax filing to outsourcing, all you need to do to sustain. Learn how to deal with complicated entrepreneurship situations and get out of it. Strategising the moves or chalking the best implementation process. Acts as your personal assistant in your quest of becoming a successful entrepreneur because it highlights processes such as eliminating negativity, hiring the best employee etc. Real life examples help you to understand several difficult instances. Ways to overcome the failure and crack the formula of becoming ridiculously successful. Formulate your own success plan with this detailed guide. With the closing chapters, you will have a foolproof plan and strategy to make the winning move. So, get your free copy today! 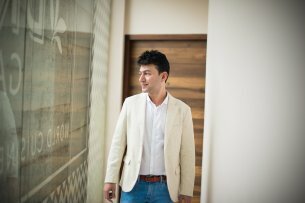 Mr. Abdul Vasi has been in the competitive game of business for years now and it is the result of unmatched hard work that paved his way to undefeated success. But now, he is stern to help the aspiring entrepreneurs in shaping a constructive career for them. So, he has invested his time and effort in creating an impeccable book that will be of aid to every zealous soul who has the motive of exploring the entrepreneurship world. 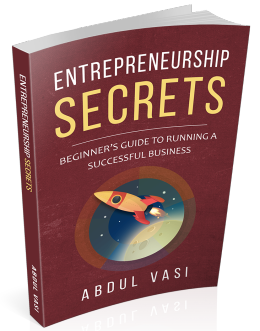 Hence, by documenting the experience of this blessed journey, Mr. Abdul Vasi has penned down the book, Entrepreneurship Secrets. How much time does it take to witness the success? It varies from person to person. One cannot expect instant success despite investing time, energy and efforts. It takes time to get the fruitful results once you practice the right processes and Entrepreneurship Secrets will be an eye-opener that will guide you in every way. In the very first chapter, you will learn the importance of being honest and transparent with your employees. It also enlightened you on how to inspire your staff to work properly without donning a different personality. The second chapter teaches you the tricks to strengthen your workforce with the help of a good payment. The employees are the key to every business. You need to listen to them and make them feel important. This chapter sheds light on this simple fact and helps you to improve your relationship with your employees. In this fourth chapter, you will learn the skills that you need to hire the right one as well as to fire the employee who is disrupting the pace of your organization. Staff conflicts affect the work culture of a company greatly. In this chapter, you will come to understand the skills you need to handle employee conflicts. It is very natural to be burdened with worries and stress. But the way you handle the stress will help you to become a great entrepreneur and that’s what you are going to learn in this chapter. Once you complete chapter 7, you will have detailed knowledge on how to automate your business processes. The 8th chapter will give you important lessons on how to maintain the records of your company along with investing in correct technologies to reinforce work culture. Accounting, paying taxes and filing returns are most important for every entrepreneur. Get to know how to perform these vital tasks efficiently from this chapter. The importance of outsourcing tasks, IP cameras and monitoring software are a few crucial things that you will learn in this chapter, will your business to grow. Workplace negativity destroys work culture and prevents you from building successful teams. Chapter 11 will thus teach you about how to build teams while eliminating the negativity completely. Inspite of having the same resources, why do some make a name for themselves while others struggles? We can say that it is the game of fate but it’s not always about luck. Hard work, persistence and most importantly, the right implementations of ideas play a major role. Entrepreneurship Secrets reveals every single trick, right choices and strategies that one must implement for gaining ultimate success. How to inspire your workforce to complete the jobs efficiently. The significance of paying good remuneration for motivating your employees. The art of hiring and managing employees. Why is teamwork the key factor in business? How to handle business stress. Why is it important to implement advanced technologies in your business? How can outsourcing tasks change the game? Tricks to pay taxes and file returns properly. About workplace negativity and how to reduce it. And most importantly, how to be the captain of the ship? Get your priorities straight and take a leap by trusting on fate! Does training have some a impact behind the success? Nobody is born as a leader. It is sheer dedication, consistency and the function of the brain that helps one to obtain a desirable position. Training is always a good idea to get some outline and knowledge about how to maintain a business but it’s always your own presence of mind that takes you way ahead. It not training that determines your success. My idea behind writing "Entrepreneurship Secrets" was to provide the young entrepreneurs who have just started to walk on this path with a clear guideline that they can follow to achieve success in their venture. The road to becoming a successful entrepreneur is not as easy as it comes with several challenges and hardships. Entrepreneurs need to make challenging decisions which can make or break their company. Most importantly, employee management is always the key factor in leading a company towards its organizational goals and ultimately success. Without having the basic knowledge, one can stumble upon the unprecedented situations that entrepreneurship presents with. Hence, it is always better to have a practical guide to help people take their decision more efficiently and "Entrepreneurship Secrets" was written to serve that purpose. Do funding and economy really build your business game strong? One cannot deny the importance of funding or economy in a business but to be precise, a business is always modelled in a way that it can gain profits by operating in the targeted economy. One can earn profits even from a weak economy if only he knows his business and the ways to deal with the environmental changes very well. 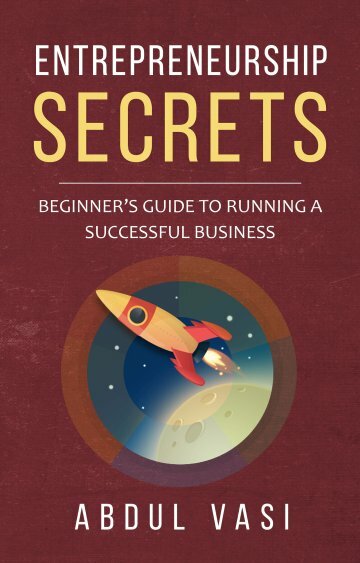 There are many other prospects that I have discussed in my book, Entrepreneurship Secrets. In case of funding, get the money but you need to utilize it to acquire further profits. If you are not witty enough to use your funds wisely, your business will come to an end. Want to give many thanks to this book for motivating me to start following my dreams again but this time, in a more refined way. I started my venture back in 2015, however, due to multiple reasons I gave up and was about to dissolve my business. But after reading the Entrepreneurship Secrets, I realized that one must not quit. And I could exactly point out the instances where I went wrong. After giving it a read, I started rectifying my faults and today, I gained my confidence back. Thanks a lot. Starting a journey as a woman entrepreneur is not easy. With many dreams but less guidance, I had no clue how to set-up a successful business. Honestly, Entrepreneurship Secrets acted as a lighting guide for me. Being less informed about the steps and processes, I had to struggle a lot in finding out the right ways and implementing the right techniques. However, this book has been my saviour as I got a deep insight into an entrepreneur’s life and taught me many vital things that will help throughout the journey. The Entrepreneurship Secrets shall be a must inclusion! The book was suggested to me by one of my friends as I was planning to start my very own venture. As a beginner, I needed some help for commencing on this competitive business world and also, I would start as a small-scale entrepreneur. Well, this book is genius. I got all the needed assistance and planned my whole office accordingly. I finally started my business and it is functioning in an orderly manner. I highly suggest this book to every beginner who is looking for some guidance. Besides being an established entrepreneur who had earned a respectable position after immense hard work, I always love reading life stories of other successful entrepreneurs. And trust me, I so related to this book. Each and every point mentioned inside the Entrepreneurship Secrets is so relatable to an entrepreneur’s life. I truly felt connected with this book as I had to go through such stages which left me completely shattered. But making the right implementations changed everything for me and the book explains all these right choices beautifully. For an easy understanding and a clear view of an entrepreneur’s life, one must add this book in their reading-list. Can one turn an unsuccessful business into a successful one? Yes. It’s never too late to re-establish your business to make it a successful one. If you are open to making changes for the betterment of your business, then you can surely reach your goal. And Entrepreneurship Secrets can help you achieve the success, even if you are fully drowned. What do you expect to find in this book? • Having a sound communication is the best way to motivate the workforce. • Listen to your employees and make them feel connected to help them understand their importance in the organization. • Be a leader and learn to lead from the front. • Establish a proper wage scale and make every position valuable. • Give your employees bonuses and incentives for hard and efficient work. • Increase the salary or make them your shareholders, take every step necessary to retain your top employees. • Give utmost importance to the ideas that your employees provide you with. • Understand what your employees need, smart employees or hardworking employees. • Take the necessary steps to help your employees evolve into extraordinary employees. • Explain the job properly and only choose the best employees. • Train your employees well and help them achieve the highest performance. • Fire the employees that cause troubles and are not team players immediately to retain the operational efficiency of your company. • Determine the cause of the conflict between employees immediately. • Talk with your employees, make them understand and take any way necessary to resolve the conflict.